Exchange Anywhere: One More Update on Lync 2013 Client! 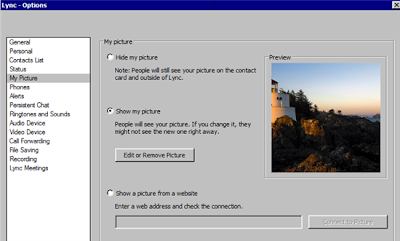 I saw a latest post from Microsoft TechNet blog posted by Jens Trier Rasmussen [MSFT], where Jens has updated that, now with the latest Lync 2013 September client update we will re-gain the functionality of adding picture from Web Address as a Lync Photo for the client, which is possible again and this option is not available in the client till date after the Lync 2013 client release. Above said information is not enough as this feature will not get automatically enabled with the update and to get this feature enabled for the client it requires the Lync Administrator to configure a new ClientPolicy entry called EnablePresencePhotoOptions through Lync Management Shell. Option not available in Lync 2013 client so far. Option will be Enabled after installing the Update and Configuring the Client policy. Once the option to Show a Picture from a web site is selected, user can specify the required web address and need to ensure that all the specified conditions are met before specifying the link and save the changes. Read the blog post to know more on this enhancement. 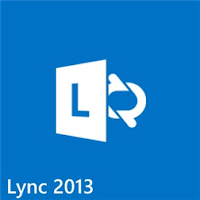 *One more here: Using Lync like a LyncPRO – Look good in federated calls! Lync 2013 September update is a quite significant update, where in it has not only made the above said feature possible for the Lync client it also re-gains us the Lync Presence Status functionality in System Tray as before and finally, It has also brought us one more new long-awaited feature "Lync Spell Check"
To Know more on this read my earlier updated blog post "Lync 2013 Spell Check"
After installing the Latest September 2013 update we will have a new issue with the Lync 2013 client in terms of Meeting Presence status due to synchronization issue between Exchange Server 2013 and Lync Server 2013. Microsoft team is aware on this issue and posted the below KB article and updated that this issue will get resolved in an upcoming update. November Client Update is more significant than the earlier ones check out the detils below to know more what new features and fixes it brings in for users.